Somehow, our two weeks at the olive farm is already over! Next up we have a brief visit to Athens and then I head back to Atlanta for a few weeks before reuniting with John in Spain in March (he's bumming around Turkey in the time being). But not so fast, we just had an amazing experience that you just might want to hear about. Charles and Ellie were living in a camper van on a beach when somebody told them about a piece of land for sale on a nearby olive and orange tree-studded hill. Oddly enough, they knew this piece of land; they had even hoped to one day call it their own. So with fate directing them, they ended their ten-odd years of vagabonding around Europe in a van and decided to stay for good in Zacharo, Greece. From the ruins of an old stone house they constructed a new, stylish home that they rent out in the summers for extra income (check it out here). It sits directly in the middle of their orchard of ancient olive trees and overlooks the town and farmland that lead up to the Mediterranean sea about 3 miles away. No, a rainbow arching over the ocean isn't picturesque at all. This was a nice little break from the day's labor. Picture it: the foothills of Olympia, a small herd of sheep and one rambunctious cow keeping the grass clean as they mingle amongst the 400-odd trees, and a wonderful family with the time and passion to groom their crop year-round and with completely organic methods. So if they rent out their home in the summer, where do they live in the meantime? Well, since they contracted themselves out as laborers to build their original home, they learned a thing or two about building. Using this knowledge combined with reading lots of books, they managed to build a small cabin about 100 feet away from their main house. It's complete with two bedrooms and a kitchen, and just barely big enough for them and their angelic four-year-old daughter Lexi. Luckily, they spend a lot of time outdoors, so things work out, and when you're a farmer for a living, you have to make things work out. You know what else makes it work out? Building the cabin only cost them about $6,000. Self-reliance is pretty cool, folks. They don't share the house with all three of these guys, only the largest one. Suffice it to say that we're learning from Charles and Ellie. As we travel on, we definitely plan to find volunteer opportunities in which we learn about building and carpentry. A wood cabin for $6,000!? I am sooo down. Speaking of working with wood, that's mostly what we've been doing as volunteers here. 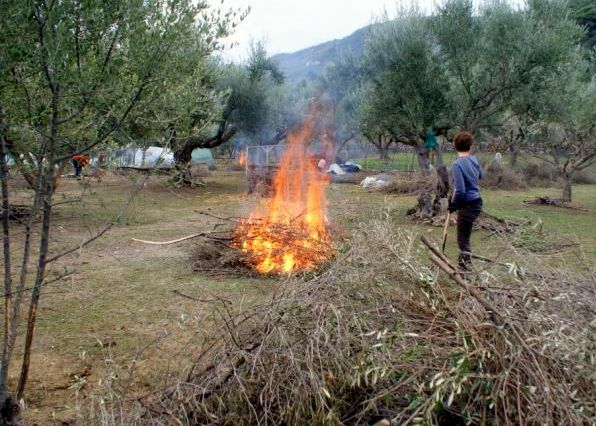 Since they recently finished the olive harvest, there are lots of branches that were pruned from the trees that have to be either burned or shorn of smaller attached branches for firewood. Since we're working off of about 400 trees, it's probably more time-consuming than you might imagine, but it's nice, methodical work that gives us plenty of time to converse and play with fires, which is always fun. And this week-or-so of work means that the heating costs for next winter are completely covered. Now that is what I call financially sustainable. Just how many pieces of firewood can you fit into the bed of a truck? One of the better parts about this experience is that Charles and Ellie always work with us, so there's a feeling of camaraderie about the work that we sometimes don't find at other farms. It's nice not to feel like an indentured servant. And probably the best part about this experience is that I get to hang out with one of the only kids I've met that is sincerely and genuinely awesome. No tantrums, no whining, no pestering, just pure, unadulterated sweetness. If ever there was something to encourage me to coexist with one of those baby-things in the future, Lexi is it. just hangin' out with the sheep. But I'll save that for the next post, so keep in touch! Because I've added an invaluable new tool to the Chowgypsy repertoire on money-saving techniques for travel, I thought I'd spend a bit more time reminiscing on the results of said tool before moving on. Spoiler Alert: we're headed to an Olive Farm! And honestly, there are just so many pictures I have to share with you. It seems sacrilegious to move on from Elea without showing you more of how utterly amazing this spot is. Just keep trying Ellie, just keep trying. It was a nice home, it had all the amenities you could dream of, and it had two amazingly sweet dogs that simply wanted to hang out with us. And it had a view. Did I mention the view? This is our "bullfrog" at sunset. Because Dilys and Les allowed us to chip away at their food supply, John and I ended up spending hardly any money on food (we of course purchased a steady supply of fresh fruits and veggies). I whipped out the money-saving kitchen staples list, and we got by on less than $35 per week to feed ourselves. And it's CITRUS SEASON!! Two pounds for a nickel, baby! And did I mention that with their enthusiastic consent, I was able to invite and spend Christmas with my mom and dad for the first time in five years? Who knew she could cut hair? For all intents and purposes, we were vacationing in one of Greece's most beautiful spots for free. For three weeks. For free. It's experiences like this that prove my theory that you can travel the world without spending much money (are you listening!?). All this is thanks to Vacation-for-Free Tool #1: Housesitting. It takes a bit of effort, just like all worthwhile things. For this housesitting assignment, we paid $60 to register on a website called TrustedHouseSitters.com and filled out a lengthy profile about ourselves essentially stating why a home/pet owner should choose us as your sitters over anybody else. We assumed a $60 payment would pay off in the long run, and it already has in our case. I will mention that we were lucky to have been chosen. Dilys told me that around 50 people applied, and we ended up being the [very] fortunate ones. The only thing I can say here is that authenticity helps when filling out these profiles--don't say things like you love dogs or you love living in isolation if you don't actually enjoy them very much. It'll be a waste of time. Once Dilys and Les returned, we had an unforgettable farewell dinner at a typical Greek restaurant. The food was amazing, due in part to the fact that the sole cook was the old woman who'd been cooking there for decades. There is somethin' about those old woman chefs. Traditional dome-like interior with few windows to keep out the sun in summer and maintain heat in winter. Fried dough balls (loukoumathes) with local honey and cinnamon. Can't go wrong with that. Local goat and goat broth soup. The meat typically looks this dry, but it's not as bad as it seems. And before I officially move on from our unforgettable experience housesitting, I'll mention a hike we went on in nearby Molaoi. Southern Peloponnese is stunning. I can't say it enough. To your right, mountains, and to your left, the sea. Yes! Another website we've found for housesitting but have so far been unsuccessful with is MindMyHouse.com. Hopefully we'll find something when we venture on to more exotic locales. Vacation-for-Free Tool #2 is a website called HelpX.net. This website links volunteers with a variety of "work" opportunities in exchange for room and board. So for our first experience, we've found two farmers on the coast of northwestern Peloponnese. British expats, they've spent the past ten odd years running around Europe in a camper van before finally settling in the town of Zacharo. 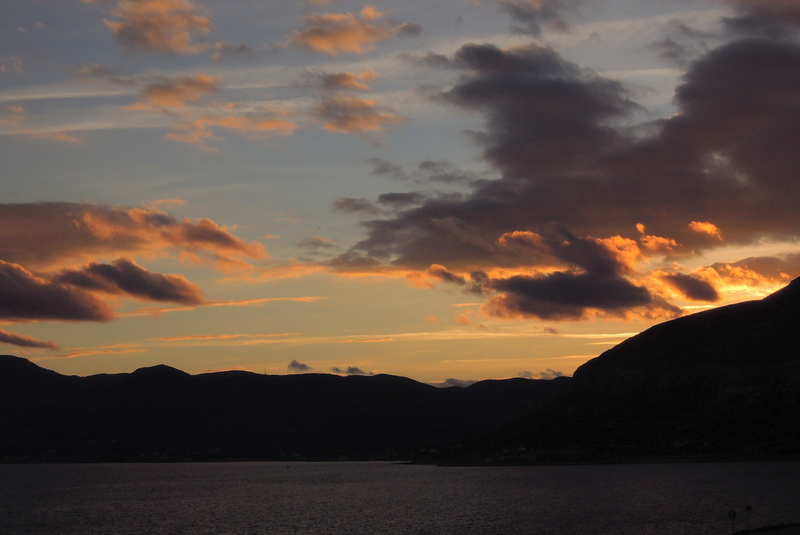 The final sunset from Dilys and Les' porch that you'll see. Unless, of course, you visit the Chowgypsy Facebook page. As we head to our next vacation-for-free spot, we will actually be doing a bit of work. But when you spend four weeks wherein the most difficult part of your day is losing at backgammon, real work is a welcome idea. Follow the farm life, click here! 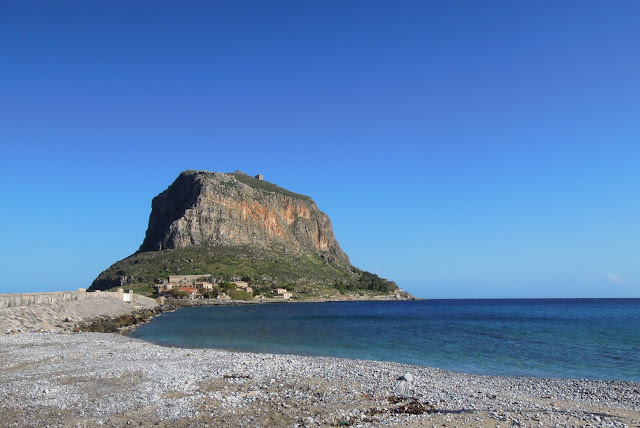 While you can't go wrong visiting the lower town of Monemvasia and (literally) getting lost within its winding, cobblestoned streets, the crowning moment of a visit to this bygone fortress is ascending a short but steep path to reach the upper city. What once was a fortified village sitting atop the plateau of our magical rock is now not much more than ruined walls, but the broken reflection of its past is all too easy to envision. Entering the upper town through a still-intact tunnel, it's not difficult to imagine a scene of armored soldiers pouring out to defend the upper stronghold, striking fear into any that dared risk an assault. Continuing the ascent, a rocky trail takes you past the oceanside crown of the fortress, where raw exposure to the elements seems to have taken the greatest toll on the ruins. Moving along, you'll pass through more in-tact ruined houses and public buildings until you reach the relatively untouched is the Byzantine Church of St. Sophia, or the Agia Sofia, built around the 12th century. This masterpiece has held strong against weather and time to ensure that if you weren't winded after the hike up, you would have this second chance to find yourself completely breathless. The view in front of the church is rather uninspiring, don't you think? Once you pull yourself away from the arresting views, follow onward and upward to reach more ruins and the vaguely-recognizable citadel. Oh, and one of the most stunning views that Greece (Europe?) has to offer. Sated on views of beautiful vistas and historical treasures, we headed back to the lower town to pass another quiet night at Hotel Byzantino, soaking in whatever remaining magic we could from the ancient walls of Monemvasia. 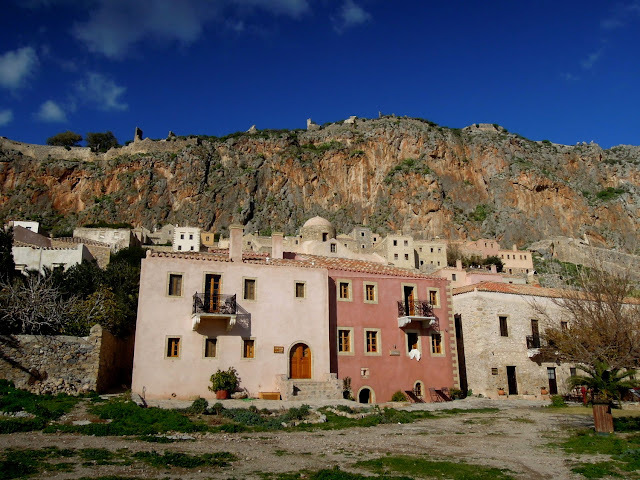 If we've learned one thing other than the fact that Monemvasia just might be our favorite place in the world, it's that when the time comes for us to splurge again, you can bet that it's going to be during a town's off-season. We saved over $100 dollars because we were here when other tourists weren't. And to show for it, we had this town and all its glorious history all to ourselves. 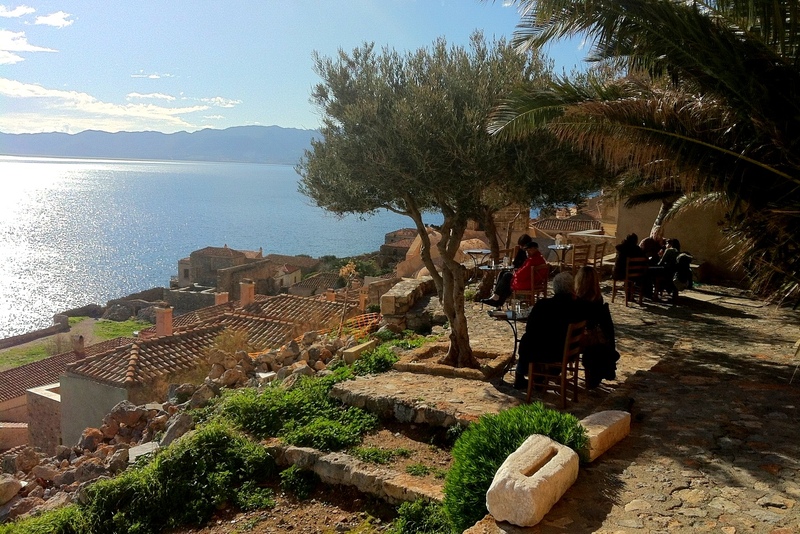 After two blissful days, John and I left what is now one of our favorite places in the world to head to our next farm in the northwestern Peloponnese. Stay tuned! And find more breathtaking pictures on the Chowgypsy Facebook page!